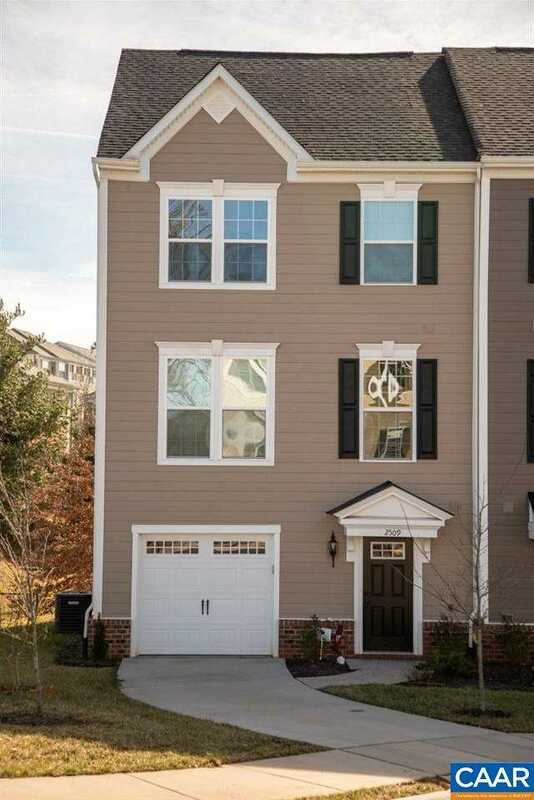 Roy Wheeler Realty Co. MLS# 585671 - 2509 Avemore Pond Rd, Charlottesville, VA 22911 - Roy Wheeler Realty Co.
End unit townhouse, on a premium lot.There are $30,000+ worth of upgrades included that make this home a pleasure to own; featuring a one car garage & a finished entertainment room at terrace level; main level boasts a cook’s kitchen w/ gas range, upgraded appliances, kitchen island, granite counter tops and maple cabinets;plus powder room, hardwood flooring throughout. Second floor has three bedrooms, including a generous master suite, with coffer ceiling, luxury bathroom.Plenty of natural light;green space around 3 sides of the home; Avemore is a quiet, well situated community – close to the Downtown Mall, Pantops, Routes 29 & 64. HOA fees of $100/ month include pool, club house,play area. Directions: Take US-250 to VA 20S (Stony Point Road). Turn right on to Fontana Drive, then take 2nd right on to Avemore Lane. Use the first exit on the traffic circle on to Avemore Pond Road; 2509 is end unit on left side.